Updated: Check out all of the recently announced cameras and other gear at the bottom of this page. 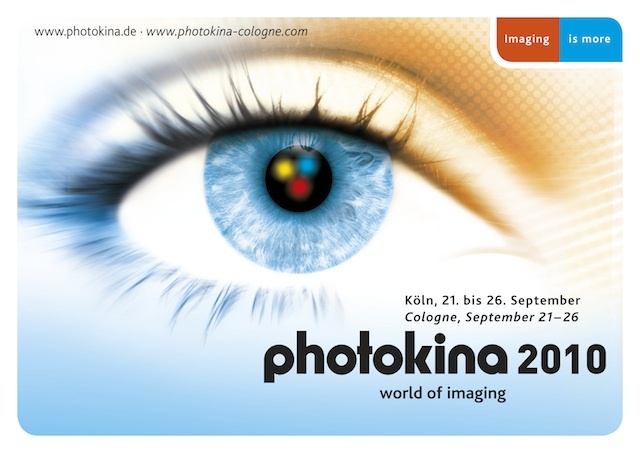 Photokina 2010 is set to take place from Tuesday, September 21 to Sunday, September 26, 2010 in Cologne, Germany. Photokina occurs every two years, and in 2008, 1523 companies exhibited at the show and more than 169,000 people attended the show. Photokina is a trade show in which many new cameras, lenses and accessories are frequently introduced. Cameras introduced at or around Photokina 2008 include, the Canon PowerShot G10, Canon Rebel XS, Canon 50D, Canon 5D Mark II, Nikon D90, Nikon D700, Panasonic G1, Pentax K2000, Sony A900 and Sigma DP2. All the major camera manufacturers are typically in attendance and are rather high profile at Photokina events. Expect no less this year. Camera features and formats haven’t seen a state of flux like we are currently seeing for quite some time. As a result, I don’t think that it would be unreasonable to expect big things from big players in the months and weeks leading up to Photokina 2010. Sony has already busted out of the gate with a serious mirrorless camera system this year, leaving the two big camera makers, Canon and Nikon, to play catch up. The industry is seemingly waiting for these traditional camera manufacturers to bless this new format by entering into the field with a product of their own. The killer (as in entry-level DSLR killer) mirrorless camera hasn’t hit the market yet. Could Canon or Nikon deliver one this year at Photokina? No one really knew what kind of potential that the Canon 5D Mark II had when it was introduced nearly two years ago. Now, with an abundance of short films, commercials and broadcast TV episodes under its belt, this market segment is a serious piece of the pie. Canon is the clear front-runner; however, Nikon is sure to add 1080p video capture at some point. The next DSLRs in the Nikon line-up would be a perfect time to seize a piece of this still-yet-to-be-defined market segment. We know Sony is working on some AVCHD-capable DSLRs, so it wouldn’t be a big surprise to see these guys at Photokina 2010. Enthusiasts have been dying for these cameras to break out to the mainstream manufacturers. It’s not a segment that’s necessarily hot, but has been rumored to be “coming” from a number of manufacturers for years now. Perhaps it’s wishful thinking, or maybe enthusiasts will soon get their serious compact cameras with DSLR-sized sensors (instead of the handful of niche products currently on the market). Of course, the rise of mirrorless camera systems could be the death knell to these pipe dreams as well. With Summer upon us, I will be adding new camera and gear announcements to this page on a rolling basis as we approach Photokina 2010. Expect any serious cameras or gear announced from now on to play a roll in manufacturers’ exhibits at this year’s Photokina. Feel free to bookmark this page for future updates, or check the front page of Photography Bay for regular updates as we approach September. Stay tuned for the latest updates in the days leading up to Photokina 2010. Will we see a Digital Rangefinder from Zeiss, Canon or Nikon. I want to see a replacement for the nikon d700.I. looking.for more mp and HD Full movie. Will we see the new release of Nikon software Capture NX3 ? I read here http://manfrottoschoolofxcellence.com/2010/09/03/manfrotto-school-of-xcellence-photokina-2010/ a new partnership between Manfrotto and Photokina 2010, what do you think about?? What about other players, I am sure that they exsist? Any news about the new Sony Alpha 750 ?? ?